Info: 3BR, 3BA Beachfront Property with 1900+ sq. ft.
Palacio condo for sale in Perdido Key. 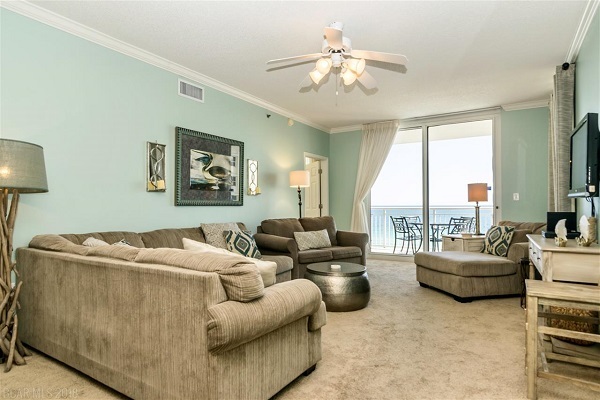 Terrific beach views from this beautiful 3BR/3BA west end unit at Palacio! The 5th floor location allows for an intimate connection with the gorgeous white sand of the gulf – you will love listening to the soothing sound of the waves lapping on shore and just sitting on your balcony soaking up some sunshine. The kitchen is spacious and well-designed, with a serving island for food prep and entertaining and there are plenty of cabinets and drawers for all your kitchen essentials. A separate wet bar with sink is opposite the dining area. Enjoy your morning coffee from the reading nook featuring a floor to ceiling picture window just off the kitchen. Guests will surely appreciate the private guest master suite with its own balcony overlooking the north end of Perdido Key. The kids will have so much fun with their friends and siblings in the functional bunk bedroom with sleep space for four. The spacious master bedroom suite offers amazing views of the gulf and has direct access to the gulf balcony. The master bedroom is large enough for a sitting area and has a separate dressing vanity opposite the walk-in closet. The master bath features an additional vanity, jetted garden tub, separate shower and private water closet. Finishing touches such as crown molding, floor to ceiling windows and slider doors make Palacio a desirable choice for buyers on Perdido Key. Palacio offers fantastic amenities such as a gulf-front outdoor pool, heated lap pool, tennis courts, exercise room, conference room, hot tub, and cookout grills. There is covered garage parking for owner use. The Palacio HOA is one of the most respected and financially sound on Perdido Key. Palacio was recently chosen to receive the Florida public service commission’s triple e award for its energy efficiency efforts. The complex is convenient to golf, dining, boating and shopping.